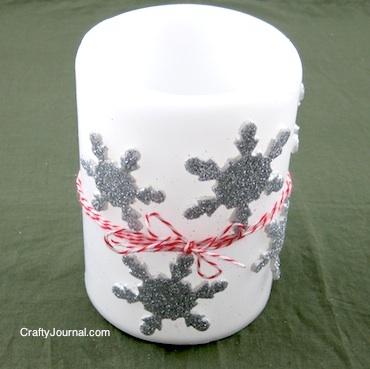 Because it’s made with a flameless candle, a snowflake candle could be an easy project for kids or preschoolers. It would be a great craft for a kids class party, and a nice take home gift. Or it could be a fun project to make for a nursing home resident. Here is the candle I found in the Dollar Store. And I used these foam stickers, which came in a large package. How to Make a Snowflake Candle. 1. Remove the label from the candle. 2. Decide how you want to put the snowflakes on it. 3. Remove the backing from the stickers and attach them randomly to the candle. 4. To finish the snowflake candle, tie ribbon or twine around it with a nice bow. How fantastic! I love your creativity. You have inspired me to make a new candle! I bet this would be a great teacher gift for the holidays. Thanks for your lovely ideas, Noreen! Always a pleasure…have a great day! Easy, inexpensive and pretty! What a great craft. Thanks for sharing at TTF! Cute, this would make a nice gift from my daughter to a Grandparent or someone special. She could put her own spin on it. Thanks for sharing. Beautiful! I also like the one with the Xmas trees! I found your post through Family Fun Friday. This is so pretty and simple too! Thank you for sharing! HI I’m KarenLynn from Lil’ Suburban Homestead! I like that this is such a quick & fun holiday project! Thanks for linking up to the “From The Farm” blog hop this week! Love this. I love anything with snow flakes & candles. This is so simple yet adorable! This would make a great craft for all ages. Thanks for linking to the In and Out of the Kitchen Link Party. Hope to see you next week. Noreen! Three of your posts were in the top 10 most clicked on last week’s Friday Flash Blog. You’re on fire! Now which one to pick to highlight tonight….